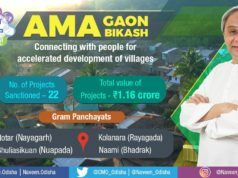 Nuapada: Chief Minister Naveen Patnaik on Tuesday inaugurated the new district Collectorate building here and laid the foundation-stones of eight development projects with a total cost of Rs 32 crore in Nuapada district. 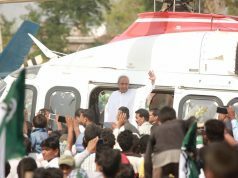 Patnaik later in a public meeting organised at the Mini Stadium here declared a health insurance scheme under the Biju Krushak Kalyan Yojana which would entitle each registered family for a benefit of up to Rs 1 lakh for health treatment. 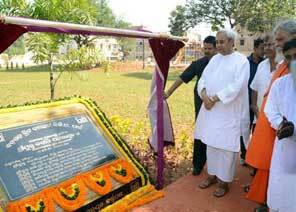 He said 60 lakh families in the State would benefit under the Biju Krushak Kalyan Yojana through use of Smart Card. He handed over Smart Cards to five farmers of the district on the occasion. He also declared some other programmes and supports for farmers and women of the district like cooperative loans to farmers at a low interest rate of 2 per cent and financial support of Rs 10,000 each as a revolving fund to 5,40,000 SHGs of the district. The foundation-stones of all the projects together were laid at the Mini Stadium which would be shifted to the respective project sites later. 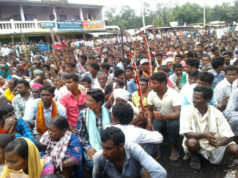 The projects include construction of four bridges in Komna block, electrification of 35 villages of the Maoist-affected Sunabeda area, 250-seat boys’ residential educational complex in a village in the foothills of the Sunabeda plateau, a 1.6-MVA 33/11 KV electrical sub-station at Saipala and an office building of the Deputy Director of Agriculture, Nuapada.